Rodney Castille rushed for more yards than any other returning player last season, running for 479 yards on 80 carries for an average of 5.9 per carry. Also returning is Jared McCray, who moved to the position at the end of last season and despite having just nine carries, average 9.1 yards per carry. After sitting out last season due to injury, Justin Connor also appears ready to make an impact, as do redshirt freshmen Cory Thomas and Lukas Reynolds. GR: Who are some of the returners out here for you this spring and what you are expecting out of them? CH: We have some excellent kids returning and one of them is Rodney Castille. He's a guy that was 5.9 a carry and over 7.5 a touch last year, super explosive guy. The only thing that ever stopped Rod last year, was me when I took him out of the game. So this year he will get his fill and get to do a whole lot more. Right now, were bringing Justin Connor back, gradually. He's a very impressive guy, who is super bought in, but coming off of a torn knee last season. This offseason, he's already squatting four or five wheels per rounds and jumping 34.5 inches. So I think it is safe to say he has got all that pop back in his leg, but were just going to continue to be smart with him. As we go deeper into spring, he will get some live reps and will be a very impactful player for us this season. Jared McCray just did a tremendous job for us last year. He learned how to play running back on Tuesday night, then went and helped us win at EKU that Saturday. He's playing in the backfield right now, he and Rod are both guys that can lineup everywhere. They can lineup at outside receiver, inside receiver or in the backfield. Jared is another dude that is super explosive, cares a ton about this, wants to be great at it and wants to do everything he can for the team. He's a kid who as a freshman was over nine yards a carry and more than that per touch. We have some really good players who have got some skin on the wall and have proven they can do it at the college level and now it's just a matter of giving them those opportunities. We also have some younger guys who get the spring to come out and get better. Cory Thomas from Alabama is a guy who is really athletic and can put it together, I think, through the spring and just become more comfortable within the offense and running and catching balls. Lukas Reynolds from Henry County is another guy who is a really, really bright kid who is super coachable, does it just how you asked and may have the best ball security I've ever seen. Powerful kid, I think he was a 3,000-yard rusher in high school, so I am excited to see what those guys can do too and they will get plenty of opportunities to show out. GR: Unlike the fall, there is no opponent in the spring, so you can just focus on yourselves. What will some areas of focus for you guys over the next five weeks? CH: The A-No. 1 is we have to win our 1-on-1's and if that becomes a 1-on-2, then we need to win the second 1-on-1 as well. Our guys are all athletic enough, that we fully expect, and the whole team knows this, that when they get the ball in space versus a defender, they are supposed to make that guy miss. We run an offense where they are going to get a lot of balls in space versus linebackers, versus safeties and we feel those are favorable matchups for us. We recruit elite athletes that are supposed to be better in open space than some of the bigger, maybe heavier or stronger, more prototypical football player and what we have to do is be more consistent in doing that. All of our guys can do it or we wouldn't put them out there with the ball, but you got to understand that's an every down, every day thing. There can't be a play where we decide to turn one down and just take the five or seven yard gain, we have to understand that when we catch that ball or are given that ball and we get a 1-on-1, our production doesn't really start until after we've made that guy miss. That's the only thing we count, we call them stud yards, like a stud horse. Studs are yards after contact, so when you break or shake a tackle, we are going to start counting what you did on that play after you made that guys miss. The goal now, is for us to get where we are doing that every, single play. GR: What are some opening day observations you had of your unit today? CH: They care a lot about this, the care a lot about each other and are going to be super coachable. 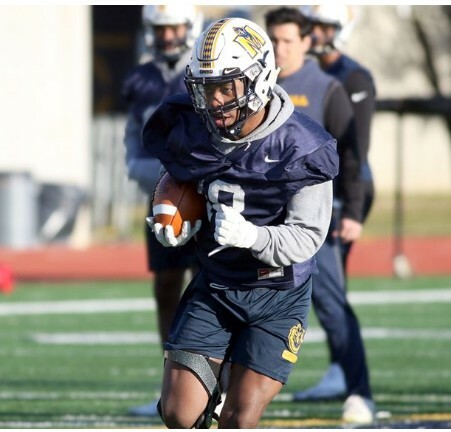 They love football, they love Murray State, they love the opportunity they've been given to represent this team and this school and they practice like it and prepare like it. Today wasn't anywhere near perfect, but the effort and focus were tremendous. As long as the effort and focus are tremendous and I do my job and I am telling them to do the right things, they will do things really hard and really fast and they will do them really well on Saturday.